From crazy diets to carb-loading, it’s easy to see why there are many misconceptions about the best fuel for your body before a day of incredible exertion. There are certain foods that should be on your weekly grocery list, as well as fueling foods for your body on a daily basis. The long grueling workouts that many endurance athletes do, can take a toll on your body and mind, but being familiar with what foods to consume in order to help your body recover faster, is vital. Vegetables and fruits that are rich in vitamins, minerals and antioxidants are what we all expect athletes to consume. 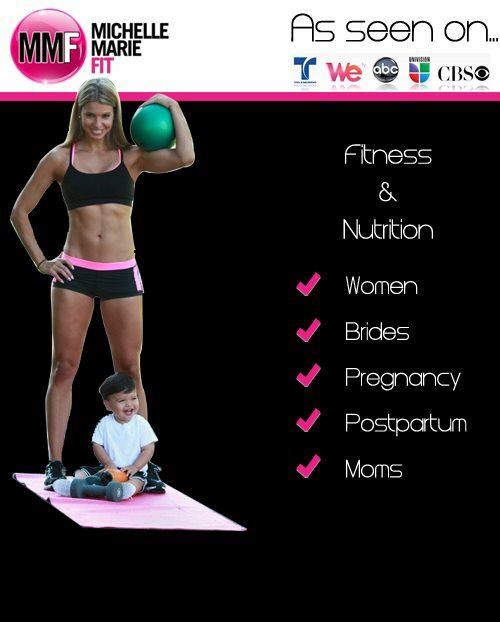 However, lean proteins, healthy fats and carbohydrates provide your body with fuel. 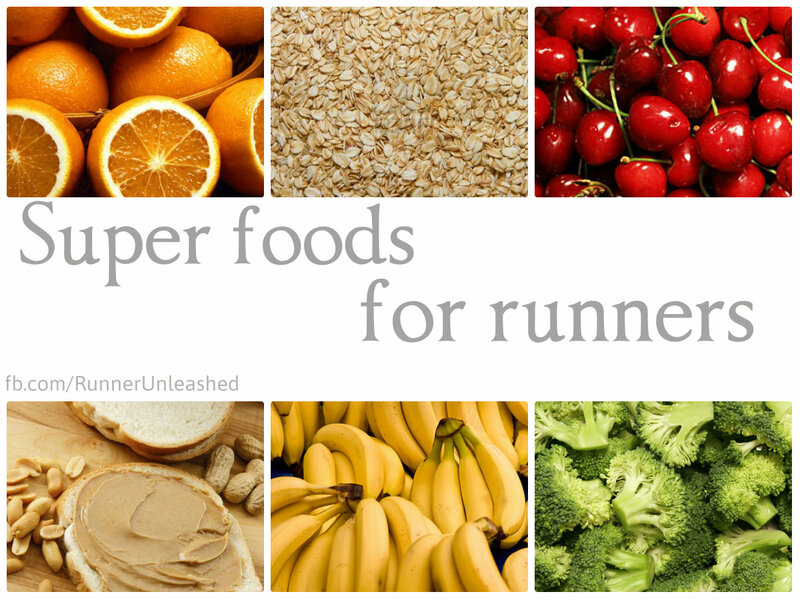 Fruits and vegetables are loaded with vitamins,minerals, and antioxidants runners need to go through training. Lots of color is good for you!! The more color you add to your diet, the more antioxidants and nutrients you’re going to get. CHERRIES get their color from anthocyanins, which is found in red and blue fruits and vegetables. 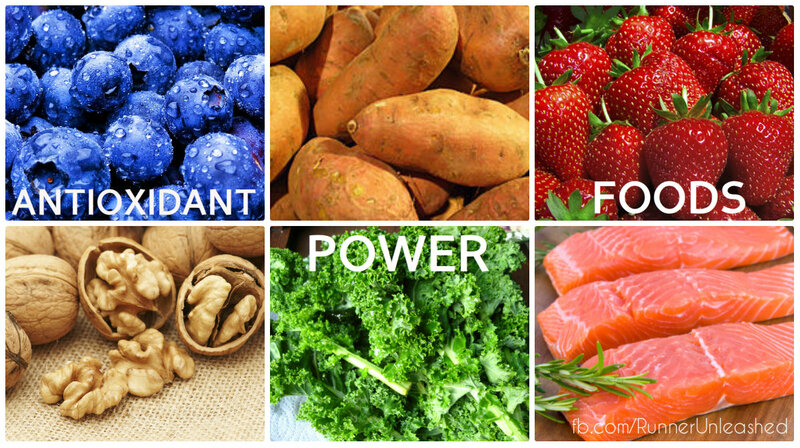 These antioxidants help protect against heart disease, as well as postrun inflammation. KALE is jam-packed with vitamin C, and vitamin K. BEETS are loaded with nitrates that can make your muscles work more efficiently during exercise by reducing the amount of oxygen they need. RASPBERRIES are high in fiber and help runners keep a healthy body weight and keeps your digestive system clean. EGGPLANT has lots of antioxidants and keeps your heart pumping. MANGO has a high vitamin C intake that can reduce upper-respiratory infections and helps keep your heart rate down during running. BANANA is full of potassium and fast digesting carbs. The potassium in the banana aids in muscle contraction and keeps muscle cramping at bay. Pasta and grains are loaded with carbohydrates, runners need the carbs as fuel to keep them running through a race. Several of us runners do a carb load the week of our long distance races. The purpose of carbohydrate loading is to give you the energy to complete an endurance event with less fatigue, improving your athletic performance. Although not every runner needs to do a carb load, such as my alpha, he doesn’t need the extra carbohydrates but it surely doesn’t hurt to eat a little more than usual. 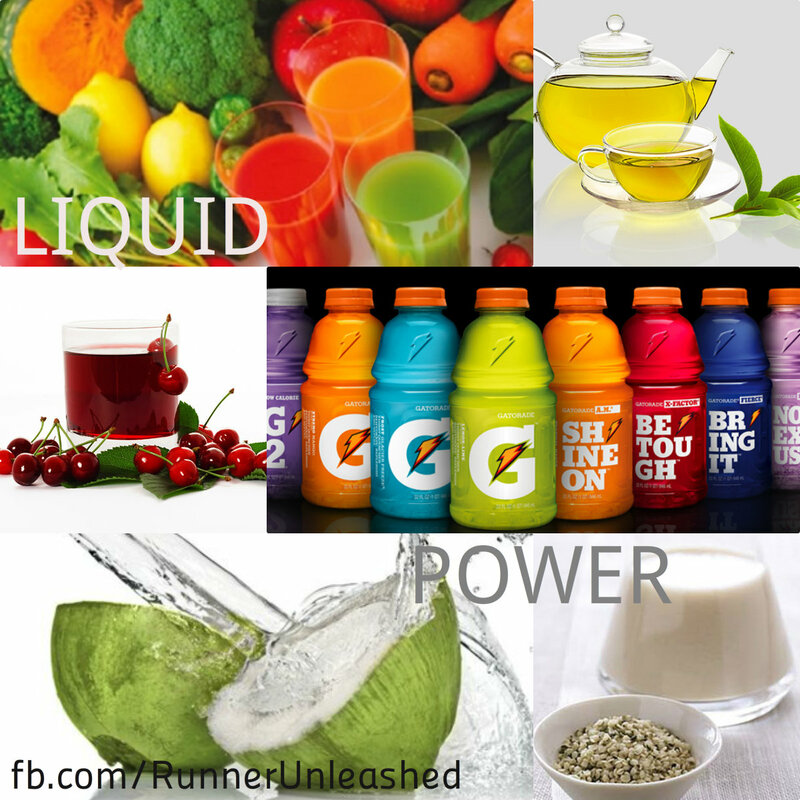 Drinking liquids is extremely important for EVERYONE, not just runners. Staying well hydrated while out running is very important, it prevents muscle cramps, and keeps you from becoming dehydrated, and keeps your performance at 100%. COCONUT WATER has natural sugars and lots of electrolytes like potassium, and several vitamins. It is a natural form of hydration that is very beneficial. Many studies have shown that coconut water has antiviral, antibacterial, anti-inflammatory and antioxidant properties that may help minor to severe health conditions.GATORADE is a great substitute, the main electrolytes are the minerals sodium, potassium and chloride. These electrolytes are often leached from the body through heavy perspiration. They are important for proper hydration, water and acid-base balance in the blood, and optimal muscle function. GREEN TEA is rich in catechins, antioxidants that help lower cholesterol and protect against exercise-induced muscle damage. TART CHERRY JUICE is also jam-packed with antioxidants that can reduce muscle damage. Lean meats and other animal products, like eggs, milk, and whey (a by-product of milk), pack a lot of protein. Four ounces of chicken breast, for example, contain about 32 grams of protein. TILAPIA is protein rich, fairly cheap, and high in omega-6 fats which help with inflammation in the body. Protein is what keeps your body healthy under the strain of running. Proper protein intake accelerates muscle growth and speeds recovery by helping rebuild muscle fibers stressed during a run. Since protein helps muscles heal faster, runners who consume the right amount are less likely to get injured. EGGS, whole eggs are one of the best sources of the nutrient choline. Besides playing a key part in brain health, choline helps keep the body’s circulatory system clear of compounds that would otherwise cause inflammation. Seeds have numerous nutritional benefits that make them the perfect food for runner’s looking for a little something extra to help them push out those extra feet and miles. CHIA SEED’S most different quality, its ability to absorb water, is highly beneficial for runners as well. Chia seeds can hold up to ten times their weight in water as they expand, and the water or other form of hydration will then be released more slowly and evenly into your system. This allows for maximum hydration, which is key when running long distances during a marathon or especially running in heat as runners lose more and more fluids through sweat while time goes on. QUINOA is full of protein and contains all 9 essential amino acids. Quinoa also contains iron, Iron carries oxygen from one cell to another and supplies oxygen to our muscles to aid in their contraction. Iron also increases brain function because the brain takes in about 20% of our blood oxygen. It also contains Magnesium; helps to relax blood vessels and thereby to alleviate migraines. Quinoa is high in Riboflavin (B2). B2 improves energy metabolism within brain and muscle cells and is known to help create proper energy production in cells. ALMONDS are excellent as they help reduce muscle damage. Great as a recovery snack. 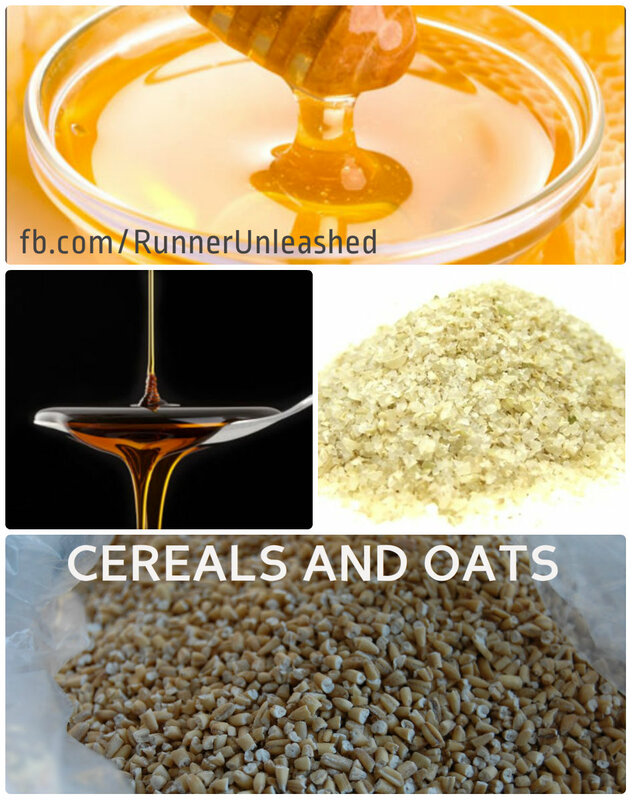 Cereals and oatmeals provide a quick source of healthy energy for runners. High fiber cereals are a good choice at any time of day except when heading out for a run since it can cause an upset stomach. HONEY is an easily digestible carb, great for midrun fuel. MAPLE SYRUP has about 20% less fewer calories than honey, and helps with muscle recovery. BROWN RICE FARINA is ground whole-grain brown rice, quick to cook and easy to digest. Perfect for a prerun snack. STEEL CUT OATMEAL is carbohydrates but of all the cereal grains they have the highest levels of protein and fat. The slow release of energy from oats (due to their complex carbohydrates) helps stabilize blood sugar levels, so eating oats for breakfast makes it easier for the body to keep blood sugar levels under control for the rest of the day, helping you avoid quick sugar fixes, like chocolate bars! It is a good source of whole grains because it sticks to your ribs without that heavy feeling you would get with other foods. Ok, so I think I covered the more important foods runners should eating on a regualry and for running performance. Running isn’t just stretching, and cross training, food is VERY important to a runner and you need to make sure you put the proper food in your body to perform better and recover quicker! I will later on touch on the best quick meals to eat before a race! Previous Previous post: Having pain in your hips while running.